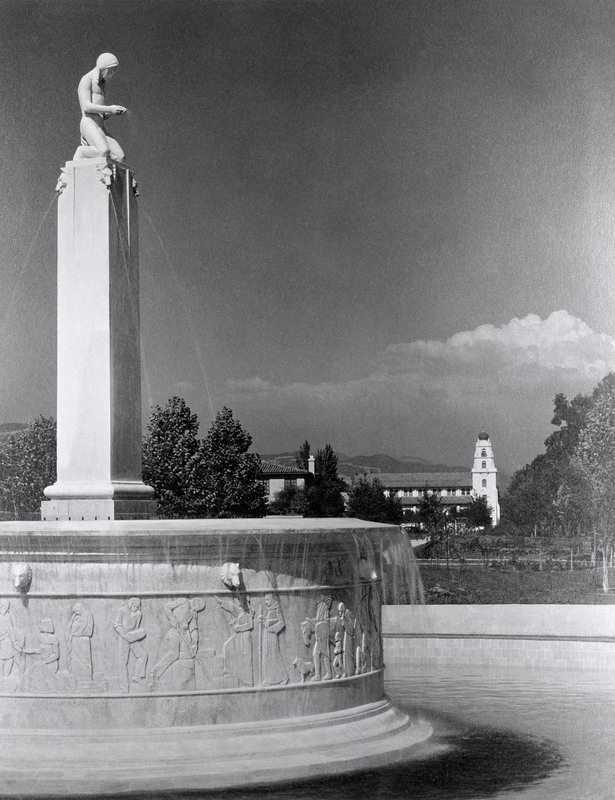 In 1930, Flewelling was commissioned to design a fountain as a tangible symbol of the Beverly Gardens Park’s mission to preserve space for cultural and art events for local residents. The first of its kind anywhere, the fountain merged the cutting-edge science of its day with Flewelling’s keen sense of aesthetic beauty. Its innovative use of automatic water sprays accompanied by changeable neon inverted lighting received more attention and praise then than any other sight in Beverly Hills. 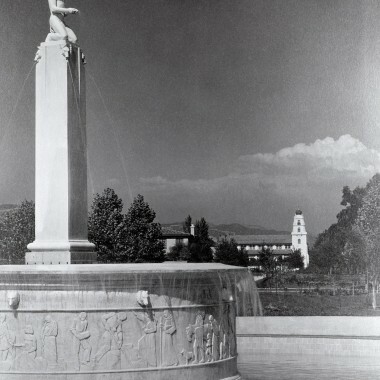 The fountain represents an allegorical story of California with a statue of a Native American performing a rain prayer and the frieze around the base, created by Merrel Gage, depicting the history of California. Located on the northeast corner of Wilshire and Santa Monica Boulevards, the fountain unexpectedly became the favorite sight of an entire community. A local newspaper reported that traffic officers had to be stationed at the intersection during rush hour to prevent traffic jams as cars slowed to look at the fountain. In December of 2000 the City of Beverly Hills re-dedicated the Wilshire Electric Fountain as an historic landmark.